By examining trends between the digital and physical ecosystem, EEDAR has found the digital space to be increasingly driving the future of new console game publishers. In recent years, the physical games market on consoles has been experiencing a consolidation of publishers and a downturn in the number of games released. From 2008 to 2014, the number of games released on the physical format across Microsoft, Nintendo, and Sony consoles declined from 383 (in 2008) to 145 (in 2014). Conversely to the physical games' market, the digital space has been growing considerably within this same time frame. Thanks to the growing focus of online digital ecosystems on consoles, more publishers than ever are releasing console games. In 2008, there were 102 digital-only games released across all consoles; in 2014, there were 279 digital-only games released, according to release data taken from EEDAR's internal database which tracks all physically and digitally released games on these platforms. 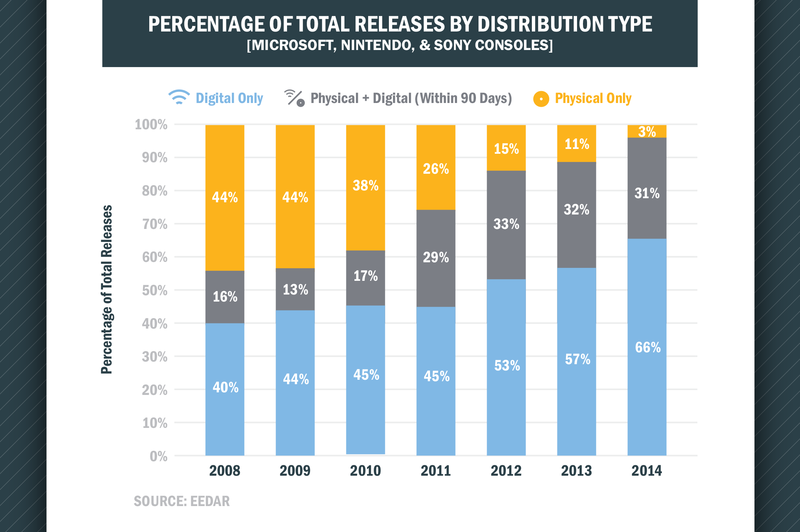 EEDAR defines the Digital Only category as games that do not have a simultaneous (within 90 days) physical release. The Physical + Digital category encompasses most AAA game releases which see simultaneous physical and digital releases, and the Physical Only category consists of games that do not also appear on digital storefronts. Nearly every title released today on consoles also makes an appearance on the console's digital storefront. The Digital Only category by itself accounts for 66 percent of total game releases. This digital ecosystem is not only reinvigorating game releases, but the number of active publishers has been increasing considerably. Since 2011, the Traditional Market (defined as Physical + Digital and Physical Only releases) has seen a decline in the number of active publishers. In 2014, there were only 46 different publishers releasing new games compared to the 82 publishers active in 2011. While the traditional market continues to be more dominated by the few larger AAA publishers, the digital space has become a hotspot for numerous smaller publishing companies. 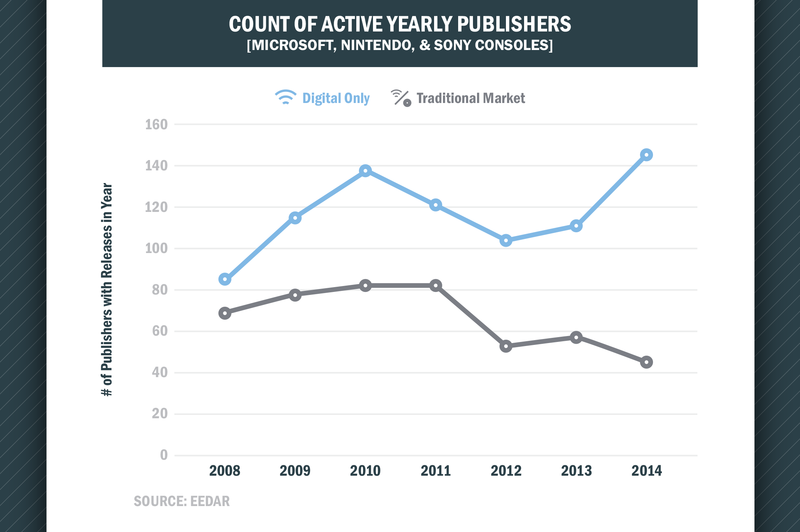 The 8th generation of consoles has caused a resurgence in publisher activity in the digital-only space. Thanks to the growing digital ecosystem and more robust digital storefront experiences on the 8th-gen consoles, publishers continue to flock to the digital games space. In 2014, the total count of publishers releasing digital-only games in the console gaming space was the highest in history at over 146 different publishers. In the Digital Only market, game releases are more spread across the active publishers. 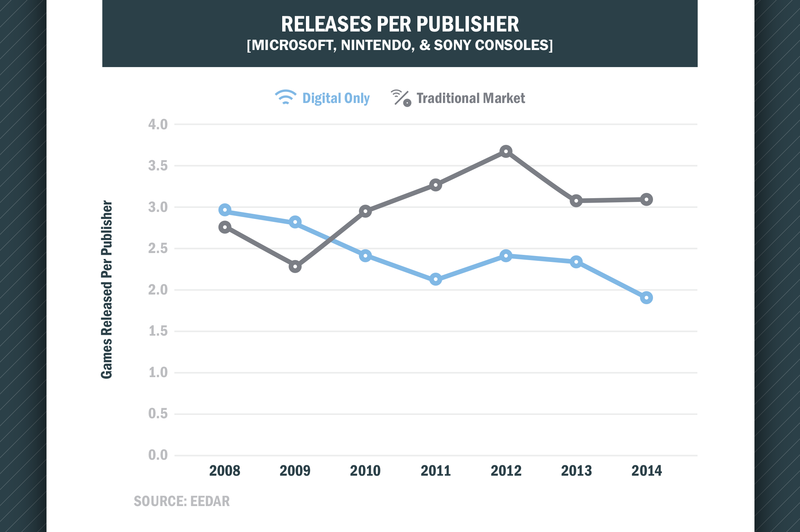 For each active yearly publisher, games released per publisher has been decreasing within the digital-only space. This represents a market with a diverse range of publishers where the larger, more established publishers do not overshadow the presence of other publishers. The digital ecosystems on console are bringing with them new opportunities and growth that is only being accelerated by the new and improved storefront experiences on 8th-gen consoles. This resurgence in the number of active publishers and the spread of their work demonstrates the growing opportunities the digital distribution space has for new publishers. The game and publisher data included in this post originates from EEDAR's GamePulse product. Please contact Cooper Waddell at cwaddell@eedar.com for more information regarding this data service. While I think there is a strong move towards the digital market and this data is a symptom that shows it, it's also a big exaggeration. Most digital only releases are smaller or indie games, that don't get retail releases, no matter if they'd like to or not (for many different reasons). If these graphs would show revenue instead of titles released, they'd be vastly different. Yes it makes sense for physical releases to consolidate and for digital releases to explode in popularity as this generation all three players are more indie friendly. Not to be exceptical, but with the big amount of indie games in this gen's consoles and the considerable number of those (and others) being distributed exclusively digitally, we should think how much of a market change is this and how much of a case of digital being the only available version.